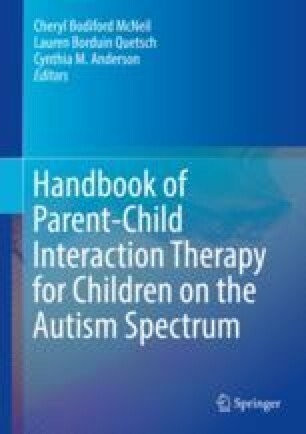 This case study describes the use of Parent-Child Interaction Therapy with Toddlers (PCIT-T) with a child diagnosed on the autism spectrum who also has an intellectual disability. The child presented with limited receptive and expressive communication skills, a history of aggression, tantrums, and noncompliance. Children with autism spectrum disorder and intellectual disabilities frequently present with co-occurring disruptive behaviors (e.g., noncompliance, defiance, aggressions) that impair their participation in important educational, home, and community activities. PCIT-T, an adaptation of standard PCIT, focuses on a developmental model for working with toddlers 12–24 months of age (Girard et al., 2018). This includes an emphasis of coaching floor play, proper toy selection, coaching verbal animation during interactions between the caregiver and child, as well as coaching animated facial expressions from the caregiver to the child. Results indicate that the coaching interventions were associated with acquisition of parenting skills and reduced problem behaviors, suggesting modifications to standard PCIT may hold benefit for children with developmental disabilities. The authors would like to recognize Dinery Egan, LMFT and Jennifer Dixon, LMFT for their clinical support and training throughout this case study.